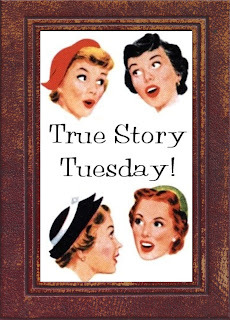 Hey y'all - time for True Story Tuesday! The perfect place to link up those amazing, outrageous, miraculous, hilarious and (mostly) true stories of your own! We all love some linkies and new friends, right? So grab the button from the sidebar and add your post - we'll send some comment love your way! If I have never mentioned that I grew up on a farm, let me tell you that I did.... Mostly. My Grandparents and Great-Grandparents had a bit of acreage that was mostly farm. The advantage being it is non invasive. So little chance for infection or bleeding to death from a wrong cut or slip of the knife. (Rach in: I am still wincing. Is this gonna be a painful one? Guys, I am reading this for the first time). Well my favorite Unc talked the teacher into letting him bring this medical marvel of non-invasive castration home!!!! Yeah I know... What was he thinking???? Now there is not a doubt in my mind that there is a God and He loves me dearly, because that just happened to be one of the weekends that I was scheduled to spend at Grampa's and Granny's (to hang with the big boys). (Rach in: Yes hon, He knew this would be marvelous True Story Tuesday fodder). (Rach in: I'm sorry, you lost me in hysterical laughter at the thought of you trying to castrate the fowl). Well having already traumatized just about anything that had a pair and moved, with the TMS's and it being fairly late in the afternoon, it was milking time. We let the cows in the barn and started to milk. This being the typical farm, Gramps had a couple of old hub caps in the barn that he always poured some milk into for the cats. We had let the cows out and were putting the milk into the milk cans, when my Unc had an epoch of clarity, did I mention that he could talk J.D. into just about anything??? (Rach in: You just love that "epoch of clarity" thing, don't ya hon? 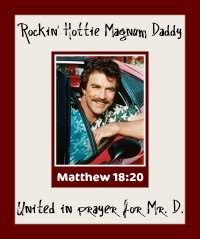 Somehow that sounds like a really nice way to describe how he came up with what is bound to result in redneck legend). Unc says to J. D., "I bet that those TMS's would do a fine job of bobbing off the tail of a cat, and seeings as how we have pretty much exhausted our supply of objects in need of said tool, it's up to us to implement new uses of said tool....(might even qualify for extra credit)"
Yep you guessed it, J. D. took the bait like a pro athlete after a syringe of steroids. Did I mention that J.D. wasn't the sharpest tool in the shed??? and had a profound stutter???? You ever hear the song, I think that Buck Owens sang it... "I've got a tiger by the tail???" Bu Ba baa baa baaa baa Bbaaaa Bud!!!!!!! He He HEl He Hellp!!!! It was just to much for Unc and I to take... we were slapping each other on the back, rolling around on the floor trying to catch our breath... (not a possibility of help from either of us). (Rach in: And I didn't think it could get any worse. I am seriously about to yell at you for something you laughed about 100 years ago). The proper blade was finally located, the skin properly severed. And do you know what?? After that old cat finally reappeared after a several day hiatus, he was the best looking bobtailed cat on the farm.... And after ole J.D. got washed up right proper like he wasn't half bad himself. And remember folks, in the words of the esteemed Red Green: " if the women don't find you handsome, they should at least find you handy"
There ya have it. True Story Tuesday from the farm. Join up your old or new post and share your stories! I'm sitting here with my mouth agape. I have no words. WHAHAHAHAHAH! That's hilarious. Ok, having grown up rural and gone back to living rural and very familiar with animal castration your story just tickled me pink. Although my husband would say who needs a tool, a sharp edge works well and doesn't bleed much if you do it right. ;)Maybe there should be focu on the do it right in that last statement. I just hope that your Grandma and Grandpa hadn't wanted to breed anything LOL! Oh those poor old Tom's. Always getting the blunt end of stick! Okay I've got nothing but a tummy ache after reading that...Poor Kitty. I am curious though about your grandparent’s reaction after they discovered all the animals were sterile? Oh my gosh. I can so see my brother doing that. Sad what us country folks do...lol. That is such a great story. I love farm stories. Funny that is what my true story topic is about this week! I'm just wondering what your grandparents thought when suddenly, none of their female ANYTHINGS could conceive. No baby cows, horses, sheep, lambs, piggies, puppies (and the rooster, he just left and never even said goodbye...). As Lewis Grizzard would have said, "Lawd, brother, I don’t believe I’d ‘a told that!” Seriously, I now understand what my husband was talking about when he told me that boys can do some pretty bad things when they're young (after I moaned about how Bug Hunter dropped a rock on a water snake in the creek at a park just to impress the big boys there. He nailed it; the snake was pinned and, I guess, drowned). Yikes...boys will be boys but that poor cat! I am so afraid of teenage boys & their antics. Sad to say, but I could totally see Stunt Man pulling a Stunt like this. Poor kitty. Wow- that's quite the story Mr. Daddy. How in the world did you keep all that commotion from the Grandparents? I wouldn't call myself an animal lover- but golly gee wiz, that's terrible! Okay. I am a daughter of a "farm girl" who is "old" like you raised by "old" parents (are you sure you're not my mom's long lost brother? I mean, seriously. They had boarders and stuff too, and weird stuff always happening. Mooooving on. I am with Brian, I thought they were gonna practice on YOU. Shew. Close one. Aside from the fact that cruelty to animals (I mean the cat, as long as the other animals survived, you didn't do any real mutilazation there lol) leads to serial killers, I have absolutely snorted and cried and laughed like an idiot throughout this whole story. And, yeah, how'd next spring turn out when there was no baby ANYTHINGS except chickens and rabbits (snicker)? Oh my goodness. I think someone has to be from the country to fully appreciate the greatness of this story. I have a barn right across the road I could (and did) imagine ALL this happening in. Down to the cats getting fed at milking time. My granny could squirt it in their mouths. Beat that! lol Oh, wait, I think you just did! I was on the edge of my seat throughout the entire story, barely breathing, just wincing and groaning as the story got worse and worse, but, like a car wreck, I was completely unable to look away! SHAME ON YOU!!! You BAD, BAD BOYS! Oooohhhh, that poor, poor cat. Oh that poor cat! And poor JD! And what did your grandparents say!! Yeah, what did they say to that??? .....wowzer!